At Carlisle Refrigeration we offer a complete, professional service that caters to every type of commercial requirement. From the inception of an idea through to installation and the security of a full back up service – you can expect the same high standard of service every step of the way. Working with a wide variety of businesses including Pirelli, United Biscuits and BNFL has helped us to develop the expertise to deal with all types and sizes of commercial refrigeration needs. 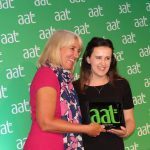 Apprentice of the Year Award Huge congratulations to our colleague, Rebecca Mooney, who was awarded Apprentice of the Year at the AAT 2018 Training Provider Awards in Nottingham last night. Well done, Becca!